Left-wing billionaire hedge fund tycoon Tom Steyer believes in democracy, the Washington Free Beacon has learned. "We absolutely believe in the democratic process," Steyer told MSNBC’s Chuck Todd on Friday, speaking in the majestic plural. "That is the process which we believe America and Americans use for major social changes." 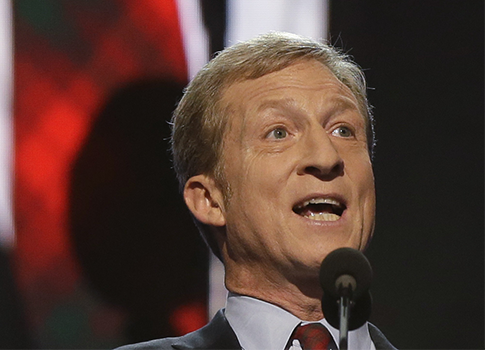 Steyer recently announced a $100 million campaign in support of candidates who embrace tax increases and regulations to fight the scientific theory known as "climate change." However, the green energy magnate remains torn between his opposition to the Supreme Court’s ruling in Citizens United and his support for American democracy. "I believe there should be a different system," Steyer said. "But right now, what we're doing is accepting American democracy rules…that’s the system we believe in." That system may be "imperfect," but American democracy has "worked for us for over 200 years," Steyer conceded. "We trust Americans to make good decisions and understand things." We applaud Steyer’s commitment to American democracy, at least until a "different system" can be established. In the meantime, he will have his work cut out him, given the American public’s skepticism toward his left-wing environmentalist agenda. Only 27 percent of Americans think "climate change" is an absolute priority, while only 41 percent agree with Steyer’s opposition to the Keystone XL pipeline. We similarly applaud Steyer for his unapologetic embrace of partisanship over principle. Todd may have introduced him as someone who is "not afraid to go after fellow Democrats to get his point across," but Steyer was quick to set the record straight. Going after Democrats who disagree with his position on climate change and Keystone, including vulnerable red-state incumbents such as Senator Mary Landrieu of Louisiana, would not "fit the prescription" of his dark money campaign, Steyer said. Lastly, we offer a hearty golf clap for Steyer’s appreciation of his rights under the First Amendment, which afford him the ability, for example, to publicly smear libertarian philanthropy baron David Koch. In a recent interview with Men’s Journal, Steyer suggested that Koch would go down in history as a "famously evil person." We await Steyer’s call for the immediate dismantling of famously evil institutions such as the David H. Koch Institute for Integrative Cancer Research at MIT, the David H. Koch Center for ambulatory care at New York-Presbyterian Hospital, and the David H. Koch Cancer Research Center at Johns Hopkins University, the David H. and Julia Koch Research Program in Food Allergy Therapeutics at the Mount Sinai Medical Center, and the David H. Koch Center for Applied Research of Genitourinary Cancers at the M.D. Anderson Cancer Center in Houston, as well as the immediate return of the $325 million Koch has donated to medical and cancer research facilities across the country. This entry was posted in Politics and tagged 2014 Election, Citizens United, Tom Steyer. Bookmark the permalink.